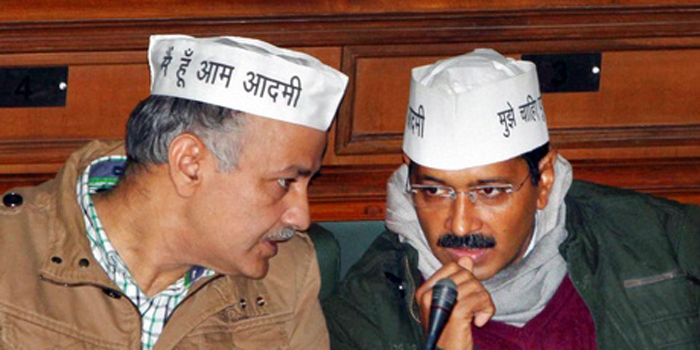 Manish Sisodia (left) and Arvind Kejriwal (File/PTI). Everyone and their grandma are busy tracing the rise and rise and rise of the Aam Aadmi Party (AAP). A year ago, the same political pundits were scornfully equating AAP with failed fringe experiments like Lok Satta. What exactly has changed in 12 months? Nothing at all. Arvind Kejriwal still wears untucked shirts, Yogendra Yadav continues to talk in the measured tones of Mr Know All, Manish Sisodia is yet to make that leap from the backstage and Anna Hazare is very much playing the part of the jealous friend. The only visible difference is in how the mass media views the AAP. The party is no longer accorded the a�?also-rana�� status. Instead, the honeymoon phase of courtship is on. A large part of the credit for the perception change goes to the Delhi election success, which in turn was fuelled by truth, purpose, hard work, idealism, audacity, leadership and a liberal dose of disgust for the establishment. I, for one, feel numbers had a small say in the unfolding of history. Numerologically, AAP is associated with two name numbers: six and one. Six is the sum total of Aam Aadmi Party and one is the numeric count of the letters AAP. Since AAP is the commonly used moniker in the election campaign, it had a larger say in influencing the course of events. Take the final tally of AAP in the Delhi Assembly. The cap-wearing dudes who chant Inquilab Zindabad and Bharat Mata Ki Jai with equal relish, bagged 28 seats. Twenty eight is 2+8, which works out to one! Youa��d be surprised to know that the words a�?Governmenta��, a�?Powera��, a�?Thronea�� and a�?Leadershipa�� add up to numeral one. Mega brands such as Google, Tata, Citibank, Garnier, Marlboro, Disney, Gillette and Coca Cola have the name number one. Someone at AAP obviously knows the power of one. Otherwise, the swearing in ceremony of Kejriwal & Co wouldna��t have been held on December 28, 2013. Twenty eight as you know is but a reflection of numero uno. Whata��s impressive is that the whole date 28/12/2013 also summates to one. Only time will tell if AAP will ever emerge as the Party No.1. When it does, just remind yourself that you read it here, first.